The most up-to-date worldwide shortwave radio handbook available today! Full A4 size sample pages - simply click the PDF or GIF symbol for download! 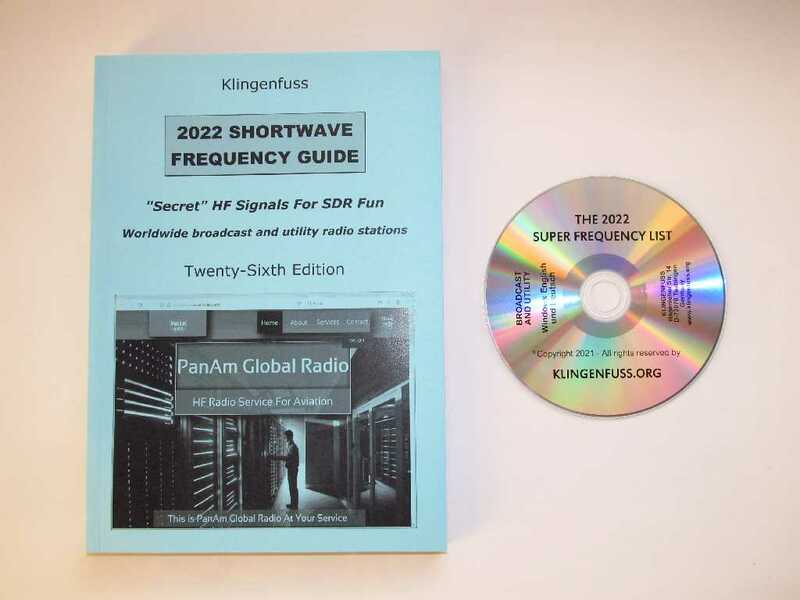 The 2019 Shortwave Frequency Guide covers the latest 2019 schedules of all clandestine, domestic, and international broadcast stations worldwide from our 2019 Super Frequency List on CD. The new edition has 350 pages. 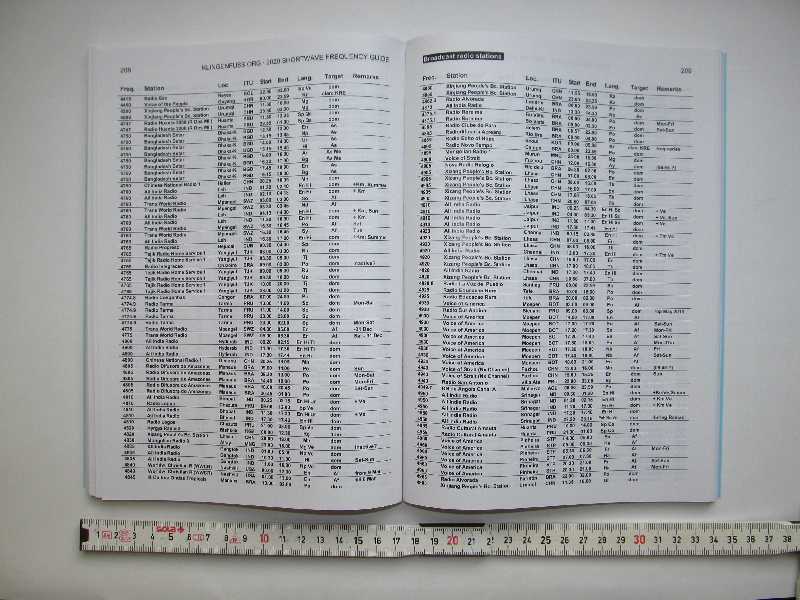 Only the 2019 Shortwave Frequency Guide features a gigantic broadcast frequency list with 4,619 entries, and a superb alphabetical list of stations as well. Another 8,467 entries cover all professional utility stations worldwide from our international bestseller 2019/2020 Guide to Utility Radio Stations. New typeface provides for excellent legibility. Two handbooks in one - at a sensational low price! Modern layout allows really easy use and quick information access. This is the only printed broadcast frequency list worldwide that gives full schedule information as well! Stations broadcasting on the same frequency are sorted in start time order. With this, you can immediately identify all stations transmitting at the same time on the same frequency. Simply the most convenient printed frequency list worldwide! 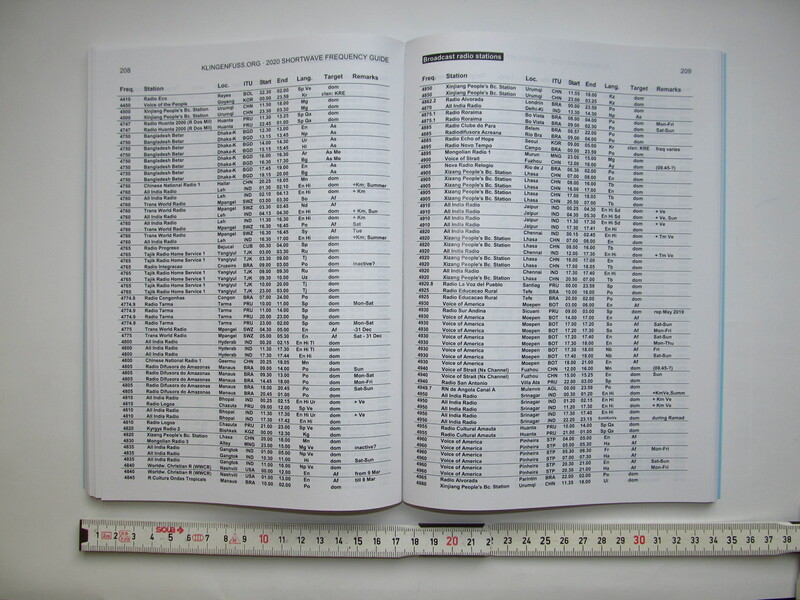 The 2019 Shortwave Frequency Guide is the printed version of our extremely popular 2019 Super Frequency List on CD: The only reference book worldwide that includes all the latest 2019 broadcast schedules at the time of publication. Deadline was 15 November 2018! Another 8,467 entries cover all professional utility stations worldwide from our international bestseller 2019/2020 Guide to Utility Radio Stations. Worldwide HF e-mail networks are perfectly covered, including the latest frequencies used now in the solar cycle minimum! A solid introduction to professional shortwave monitoring is included as well, plus 930 abbreviations. The 2019 Shortwave Frequency Guide covers very latest technical developments by really innovative broadcast (!) stations such as Shortwave Radiogram's test of state-of-the-art digital data signals for the transmission of text and graphic files. Click the graphics for download! Fascinating screenshots of the PERSEUS Software-Defined Receiver (SDR) applied for the reception of professional utility radio stations are included. Our brandnew 2019 Frequency Database for the Perseus LF-HF Software-Defined Receiver now covers 13'086 up-to-date broadcast and utility radio station HF frequencies - all in one file combined! Contrary to traditional publications in this field, our business attitude is more customer-oriented. This is a product for shortwave listeners and radio users, and not for equipment manufacturers or radio stations! As you can clearly see from the above samples, our unique layout represents by far the most clearly arranged frequency and schedule tables worldwide. Year after year, we pay tenthousands of EUR for the high quality of our data. Year after year, our famous databases are totally revised - from scratch! Says Mike Richards G4WNC, Decode Editor of Radio User, United Kingdom: "... The paper quality and binding are excellent and the book easily opens and remains open at the selected page without having to break its spine." Due to popular request, we offer you a special package price of only 60 EUR for both this book and the 2019 Super Frequency List on CD ordered together. Click here for more package deals!